I was shopping in Bahetle today and while searching for spinach I found a pack with fresh basil. It was just impossible to tear my nose from these fragrant leaves, so the pack came with me. My new food processor got delivered just today and that was a brilliant chance to see it in action. I was going to make fresh pesto. Pesto is my huge passion. To me it's one of the most beautiful sauces in the world. I routinely have it in my fridge to snack with a piece of ciabatta. I first tried it as part of caprese salad. Drops of fine pesto were covering the slices of tomatoes and tender mozzarella di bufala. Caprese is my favorite salad till today and I keep ordering it whenever I'm in an Italian restaurant. 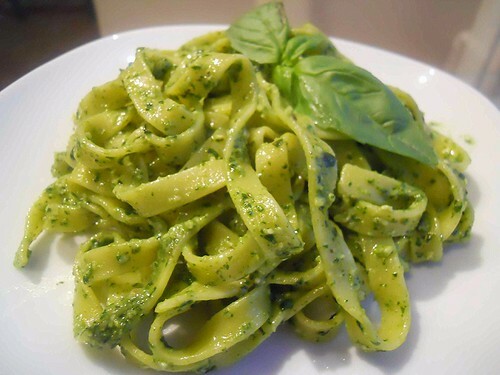 Whenever I order pasta with pesto in a restaurant I end up frustrated though. I don't know why, but it never tastes as good to me as the pasta with fresh home made pesto. So pesto pasta is something I do make at home. As making it I deal with fresh fragrant basil it always turns into a great joy. So it did today. Though a more classical way is to use mortar and pestle I prefer making pesto in a food processor. Place the basil leaves and salt into a food processor and pulse. Add the pine nuts and pulse again. Add half the parmesan and a couple of table spoons of olive oil. Process to reach quite a fine texture. Add the rest of the parmesan and enough olive oil to reach the sauce texture. For pasta I prefer to leave it quite thick. Adjust the salt to taste. Cook the pasta al dente and drain. Keep some cooking water. Add the pesto to the pan with the pasta and toss well. Add a little cooking water to help the sauce mix in. Serve immediately with fresh basil and some more freshly grated parmesan if you wish. Try pasta al pesto with potatoes and green beans (fagiolini), the way they do it in Genova, that's really smth! Your pesto looks fantastic! (I also don't put garlic in mine). I found you through Food Frenzy. New follower! Thanks a lot for saying this about the pesto. Feels amazing to hear that from someone who actually knows how it should be!